Iran, a member of the Organization of the Petroleum Exporting Countries (OPEC), ranks among the world’s top three holders of both proven oil and natural gas reserves. Iran is OPEC’s second-largest producer and exporter after Saudi Arabia, and in 2008 was the fourth-largest exporter of crude oil globally after Saudi Arabia, Russia, and the United Arab Emirates. Natural gas accounts for half of Iran’s total domestic energy consumption, while the remaining half is predominately oil consumption. The continued exploration and production of the offshore South Pars natural gas field in the Persian Gulf is a key part of Iran’s energy sector development plan. According to Oil and Gas Journal, as of January 2010, Iran has an estimated 137.6 billion barrels of proven oil reserves, or roughly 10 percent of the world's total reserves. Iran has 40 producing fields (27 onshore and 13 offshore) with the majority of crude oil reserves located in the southwestern Khuzestan region near the Iraqi border. Iran's crude oil is generally medium in sulfur content and in the 28°-35° API range. In 2008, Iran exported about 2.4 million bbl/d of oil, primarily to Asia and OECD Europe countries, making it the fourth largest exporter in the world. The state-owned National Iranian Oil Company (NIOC), under the supervision of the Ministry of Petroleum, is responsible for oil and natural gas production and exploration. The National Iranian South Oil Company (NISOC), a subsidiary of NIOC, accounts for 80 percent of oil production covering the provinces of Khuzestan, Bushehr, Fars, and Kohkiluyeh and BoyerAhamd. Though private ownership of upstream functions is prohibited under the Iranian constitution, the government permits buyback contracts which allow international oil companies (IOCs) to enter into exploration and development contracts through an Iranian affiliate. The contractor receives a remuneration fee, usually an entitlement to oil or gas from the developed operation. 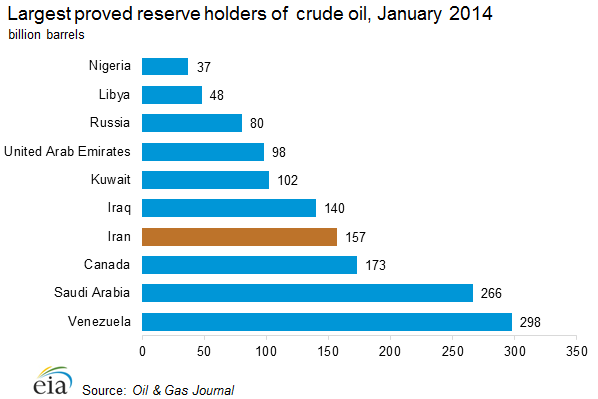 Iran is OPEC’s second-largest producer after Saudi Arabia. In 2008, Iran produced approximately 4.2 million barrels of oil per day (bbl/d) of total liquids, of which roughly 3.9 million bbl/d was crude oil, equal to about 5 percent of global production. For most of 2009, it is estimated that Iran’s crude production was approximately 3.8 million bbl/d, almost 500,000 bbl/d above Iran’s estimated 3.3 million bbl/d OPEC quota. Iran’s 2009 crude oil production capacity is estimated to be 3.9 million bbl/d. Iran produced over 5 million bbl/d of oil in 1978, but since the 1979 revolution a combination of war, limited investment, sanctions, and a high rate of natural decline in Iran’s mature oil fields have prevented a return to such production levels. Iran’s fields have a natural annual decline rate estimated at 8 percent onshore and 11 percent offshore, with recovery rates at 20-25 percent. An estimated 400,000-700,000 bbl/d of crude production is lost annually due to declines in the mature oil fields. To offset natural decline rates, Iran’s oil fields require structural upgrades including enhanced oil recovery efforts such as natural gas injection. 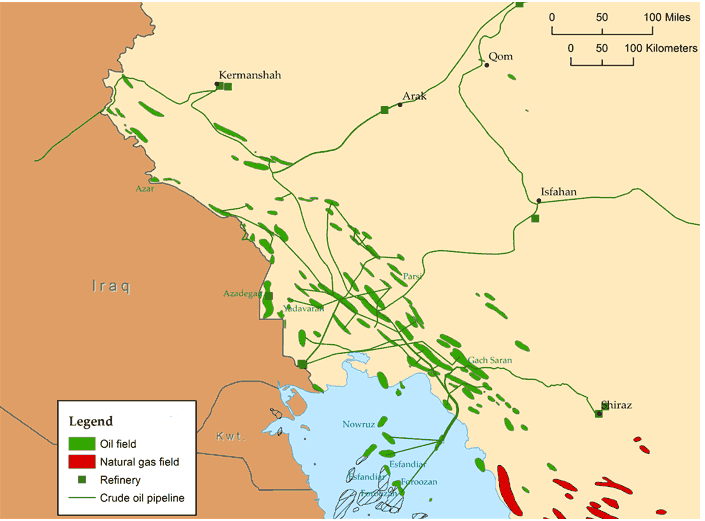 The Azadegan field, managed by Petroiran, contains 26 billion barrels of proven crude oil reserves, but its geologic complexity makes extraction difficult. Since 2008, production from the southern part of the field has been approximately 20,000 bbl/d. In November 2009, southern Azadegan produced 35,000 bbl/d, and is expected to reach 45,000 bbl/d in 2010. In January 2009, China National Petroleum Corporation signed a buyback contract with NIOC to develop northern Azadegan in two phases. Phase one, expected to be completed in 48 months, will add approximately 30,000 bbl/d of production. Phase two is expected to take 42 months to complete upon phase one’s completion, and will add 75,000 bbl/d, bringing Azadegan’s total production to 150,000 bbl/d. In June 2009, the world’s largest gas-reinjection project began on Iran’s Agha-Jari oil field. Approximately 3.6 billion cubic feet (Bcf) of gas is planned to be injected into Agha-Jari, though technical difficulties have limited the amount to around 3 Bcf. In operation for approximately 70 years, Agha-Jari production is planned to rise from 140,000 bbl/d to 200,000 bbl/d when the full injection amount is realized. The gas is supplied by Iran’s South Pars phases 6, 7, and 8 via the IGAT-5 Pipeline (see the Natural Gas section for more information on South Pars and the IGAT pipelines). According to a 5-year development plan submitted to the Majles (Iran’s Parliament) in January 2010, Iran plans to increase oil production capacity to 5.1 million bbl/d by 2015, but foreign assistance will likely be necessary. 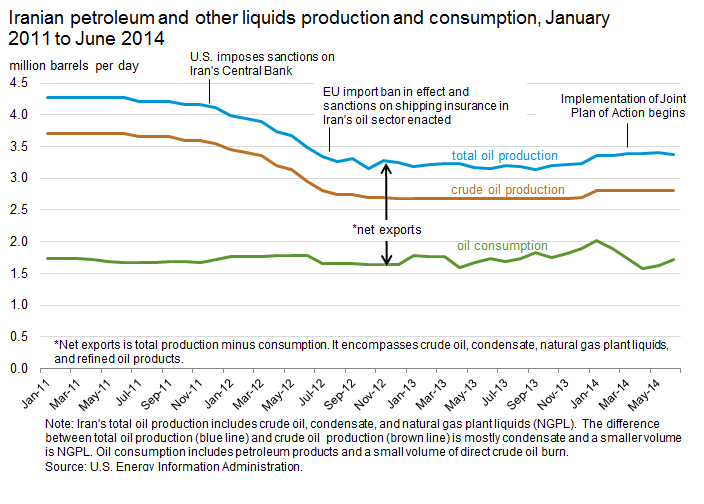 Iran’s oil consumption was approximately 1.7 million bbl/d in 2008. Iran has limited refinery capacity for the production of light fuels, and consequently imports a sizeable share of its gasoline supply. Iranian domestic oil demand is mainly for diesel and gasoline [see below for more detailed information on the gasoline market in Iran]. According to FACTS Global Energy, diesel consumption was roughly 570,000 bbl/d in 2008, nearly 90 percent of which was produced domestically. Domestic demand for other oil products is declining as natural gas is further integrated into Iran’s energy consumption makeup. The Iranian government subsidizes the price of refined oil products, but in January 2010 Iran’s Guardian Council approved measures with the aim of eliminating energy subsidies by 2015. However, Iran is an overall net petroleum products exporter due to large exports of residual fuel oil. Iran’s total refinery capacity in 2009 was about 1.5 million bbl/d, with its nine refineries operated by the National Iranian Oil Refining and Distribution Company (NIORDC), a NIOC subsidiary. Iranian refineries are unable to keep pace with domestic demand, but Iran plans to increase refining capacity to around 3 million bbl/d by 2013. Increases through expansions at existing refineries as well as planned grass-root refinery construction, could eliminate the need for imports by 2013. In addition, Iran has discussed joint ventures in Asia, including China, Indonesia, Malaysia, and Singapore to expand refining capacity. 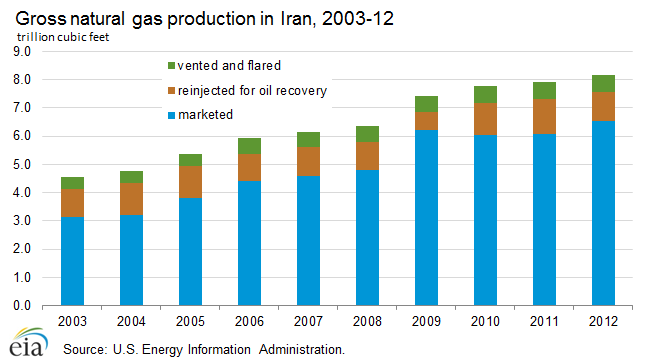 In 2008, Iran consumed around 400,000 bbl/d of gasoline, roughly the same amount as in 2007. Iran does not currently have sufficient refining capacity to meets its domestic gasoline and other light fuel needs. However, according to FACTS Global Energy, government targets for domestic gasoline refinery projects combined with the elimination of gasoline subsidies could make Iran a gasoline exporter by 2013. FACTS Global Energy forecasts approximately 2% demand growth in 2010, increasing to 3% through 2015. In late December 2009, private motorist gasoline quotas at the subsidized price of $0.38 per gallon ($0.10 per liter) was reduced from 26 gallons per month (g/m; 100 liters per month) to 21 g/m (80 liters per month). Part-time taxis, commercial vehicles, and government vehicles have special allowances. Iranian officials have publicly discussed the possibility of reducing the subsidized quota to around 16 g/m (60 liters per month). 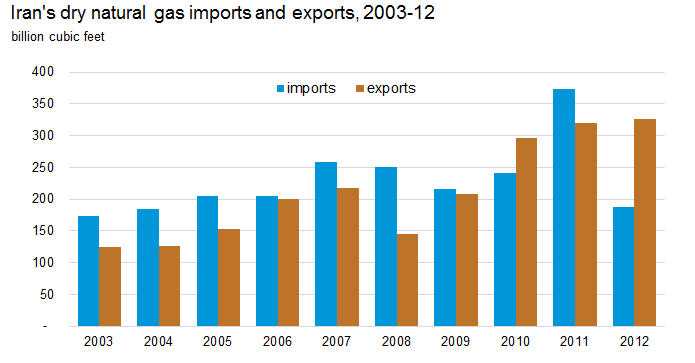 Iran gasoline imports approximated 130,000 bbld/ in 2009, nearly 80 percent of total product imports. Over the course of the year, Iran’s gasoline import sources and volumes may change. For example, a company trading gasoline volumes in March may raise, lower, or not supply volumes in April, or any other month of the year. According to industry sources, some large, multinational wholesalers such as Glencore, Trafigura, and Vitol regularly provided Iran with gasoline in 2009. In 2008, Iran exported approximately 2.6 million bbl/d of petroleum. 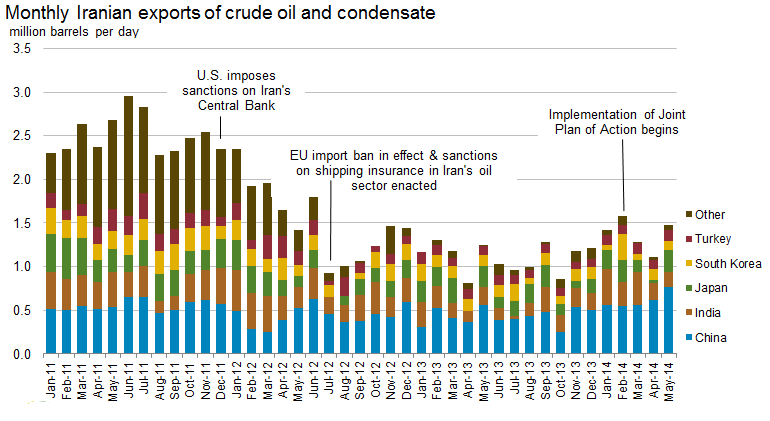 Iranian Heavy Crude Oil is Iran’s largest crude export followed by Iranian Light. In 2008, Iran’s net oil export revenues amounted to approximately $73 billion. Oil exports provide approximately half of Iran’s government revenues, while crude oil and its derivatives account for nearly 80% of Iran’s total exports. Iran suffers from budget deficits due to a growing population and large government subsidies on gasoline and food products. According to Iranian press, for the first half of the Iranian year, the government paid nearly $18 billion in subsidies for gasoline. Iran has the largest oil tanker fleet in the Middle East. The National Iranian Tanker Company holds 29 ships, including Very Large Crude Carriers. There have been reports that Iran uses its oil tanker fleet to store oil when its export terminals are full. Kharg Island, the site of the vast majority of Iran’s exports, has a crude storage capacity of 20.2 million barrels of oil and a loading capacity of 5 million bbl/d, followed by Lavan Island with capacity to store 5 million barrels and loading capacity of 200,000 bbl/d. Other important terminals include Kish Island, Abadan, Bandar Mahshar, and Neka, which helps facilitate imports from the Caspian region. The Strait of Hormuz, on the southeastern coast of Iran, is an important route for oil exports from Iran and other Persian Gulf countries. At its narrowest point the Strait of Hormuz is 21 miles wide, yet an estimated 17 million barrels in the first half of 2008 or roughly two-fifths of all seaborne traded oil, flows through the Strait daily. As per the Iran Transactions Regulations, administered by the U.S. Department of Treasury’s Office of Foreign Assets Control (OFAC), U.S. persons may not directly or indirectly trade, finance, or facilitate any goods, services or technology going to or from Iran, including goods, services or technology that would benefit the Iranian oil industry. U.S. persons are also prohibited from entering into or approving any contract that includes the supervision, management or financing of the development of petroleum resources located in Iran. Iran has an expansive domestic oil network including 5 pipelines, and multiple international pipeline projects under consideration. Iranhas invested in its import capacity at the Caspian port to handle increased product shipments from Russia and Azerbaijan, and enable crude swaps with Turkmenistan and Kazakhstan. In the case of crude swaps, the oil from the Caspian is consumed domestically in Iran, and an equivalent amount of oil is produced for export through the Persian Gulf with a Swiss-trading arm of NIOC for a swap fee. According to Oil and Gas Journal, as of January 2010 Iran’s estimated proven natural gas reserves stand at 1,045 trillion cubic feet (Tcf), second only to Russia. Over two-thirds of Iranian natural gas reserves are located in non-associated fields, and have not been developed. Major natural gas fields include: South and North Pars, Kish, and Kangan-Nar. In 2008, Iran produced an estimated 4.1 Tcf of natural gas and consumed an estimated 4.2 Tcf; the difference made up by imports from Turkmenistan (see below). Natural gas consumption is expected to grow around 7 percent annually for the next decade. Both production and consumption have grown rapidly over the past 20 years, and natural gas is often used for re-injection into mature oilfields in Iran. According to FACTS Global Energy, Iran’s natural gas exports will be minimal due to rising domestic demand even with future expansion and production from the massive South Pars project. In 2008, roughly 70 percent of Iranian natural gas was marketed production, approximately 16 percent was for enhanced oil recovery gas re-injection, and shrinkage, loss, and flaring accounted for about 14 percent. As with the oil industry, natural gas prices in Iran are heavily subsidized by the government. The National Iranian Gas Company (NIGC) is responsible for natural gas infrastructure, transportation, and distribution. Due to the poor investment climate, some international oil companies including Repsol, Shell, and Total have divested from Iran’s natural gas sector. 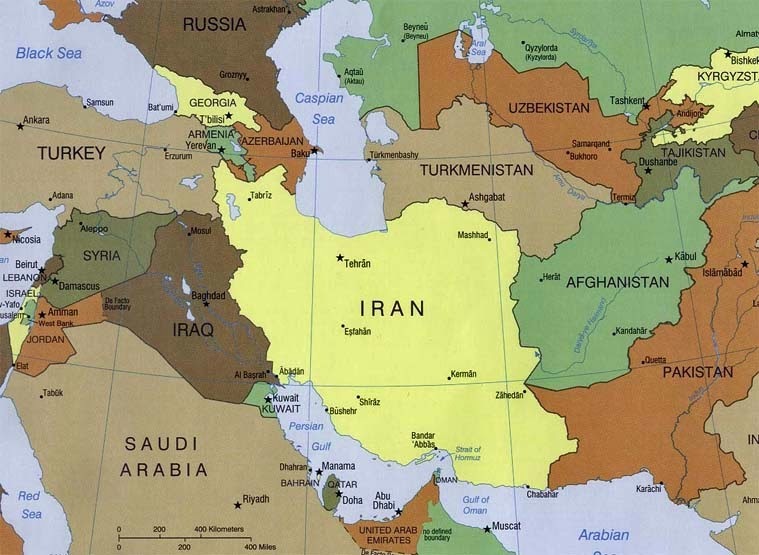 In response, Iran has looked toward eastern firms, like state-owned Indian Oil Corp., China Petroleum & Chemical Corporation, and Russia’s Gazprom to take an increased role in Iranian natural gas upstream development. Under Iran's buy-back scheme, foreign firms hand over operations of fields to the National Iranian Oil Company (NIOC), and after development they receive payment from natural gas production to cover their investment. National Iranian South Oil Company (NISOC), a subsidiary of NIOC, is responsible for much of the southern natural gas production. 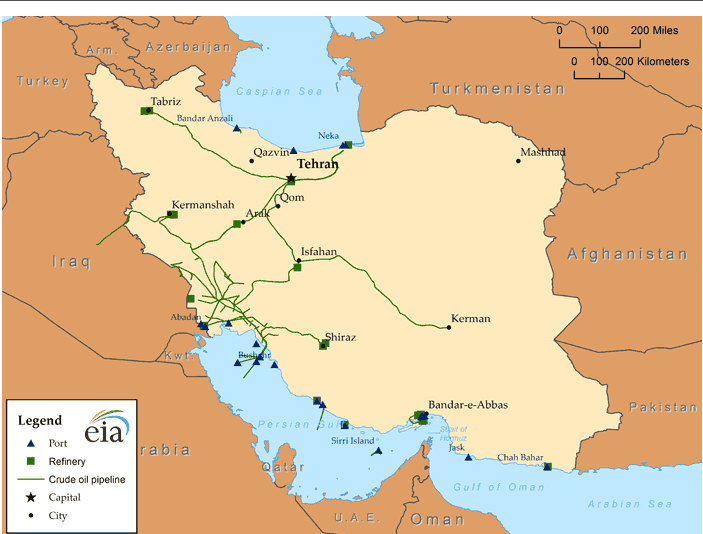 Iran imports natural gas from its northern neighbor Turkmenistan. Due to pricing disagreements, supply is irregular, but in 2008 up to 0.8 Bcf per day (Bcf/d) was imported from Turkmenistan. In July 2009, Turkmenistan and Iran signed an agreement to increase gas imports up to 1.2 Bcf/d pending the 2010 completion of a new pipeline. The most significant energy development project in Iran is the offshore South Pars field (called the North Field in Qatar), which is estimated to have 450 Tcf of natural gas reserves, or around 47 percent of Iran’s total natural gas reserves. Discovered in 1990, and located 62 miles offshore in the Persian Gulf, South Pars has a 25 phase development scheme spanning 20 years. The entire project is managed by Pars Oil & Gas Company, a subsidiary of the National Iranian Oil Company. Each phase has a combination of natural gas with condensate and/or natural gas liquids production. Phases 1-10 are online. The majority of South Pars natural gas development will be allocated to the domestic market for consumption and gas re-injection. The remainder will either be exported to South Asia or Europe, used for LNG production, and/or used for gas to liquids (GTL) projects. Pars Oil and Gas Company (PAGC) is responsible for upstream LNG development, and downstream development is divided amongst various companies including the National Iranian Gas Export Company (NIGEC). Iran’s LNG production will come from different projects, each associated with a phase of the South Pars development: Pars LNG (South Pars Phase 11), Iran LNG (South Pars Phase 12), and Persian LNG (South Pars Phase 13). Currently, South Pars Phase 12 is slated to provide Iran LNG with feedstock. Iran needs international partners to develop its LNG potential and at present, discussions for partnership are underway with international oil companies and/or national oil companies not affected by US economic sanctions. According to FACTS Global Energy, Iran’s annual LNG exports may peak around 1,462 Bcf once all projects are complete. LNG projects inIran lag behind neighboring Qatar, the world’s largest LNG exporter. Iranian natural gas field exploration occurs in the Fars province including the Varavi, Shanol, and Homa fields, and in the Persian Gulf Salman gas field. In November of 2008, NIGC announced it was partnering with Indian firm Oil and Natural Gas Corp to produce recoverable gas reserves estimated at 12.8 Tcf from the Farsi Block. In April of 2008, NIOC announced the discovery of a field containing an estimated 740 Bcf of recoverable sour gas in the southwestern province of Khuzestan. In late 2007, NIOC announced the discovery of an 11.4 Tcf new gas field in the Fars province, of which at least 8.5 Tcf is estimated to be recoverable. 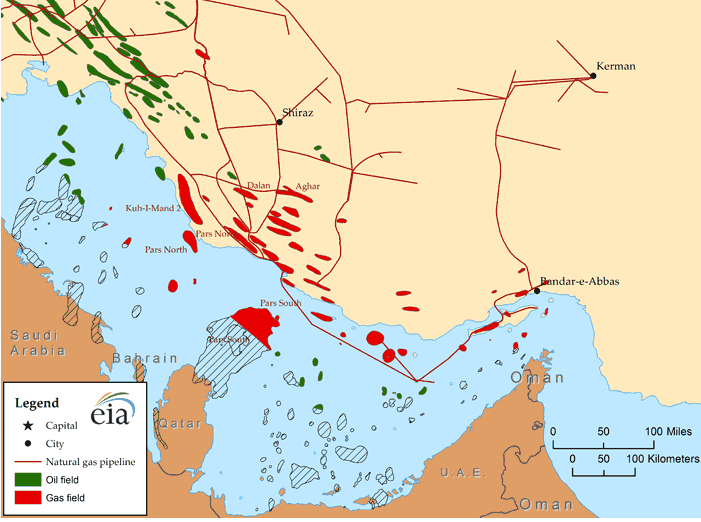 In April 2008, Oman and Iran signed an agreement to develop Iran’s offshore Kish field. With estimated reserves of 50 Tcf, Oman will invest $7 billion in developing Kish in the hopes of producing 3 Bcf/d of natural gas. Phase I of the project, tentatively scheduled for first delivery to Oman by 2013, will produce approximately 2 Bcf/d; 65% of production will remain in Iran, the remaining 35% goes to Oman. Phase II of the project will produce 1 Bcf/d to be used for Iranian purposes. Developments in the Iranian Gas Trunkline (IGAT) pipeline series, all fed by South Pars development phases, are important to Iran’s natural gas transport. IGAT-7 (2011) will transport up to 3 Bcf/d of gas along southern Iran, between Assaluyeh and Iranshahr. IGAT-8 (2012) will run nearly 650 miles to Iran’s northern consumption centers, including Tehran. IGAT-9 is an estimated $8 billion pipeline proposed to run from Assaluyeh to the northwestern city of Bazargan. IGAT-9 is unique in that for the first time, Iran is offering a build-own-operate contract for construction of its pipelines. The 745 mile Iran-Turkey pipeline, completed in 2001, can transport up to 1.4 Bcf/d of natural gas. The 87-mile long Iran-Armenia pipeline will transport 86 Mcf/d to Armenia in exchange for 3.3 billion kilowatt hours of electricity. Iran’s participation in the Nabucco gas pipeline project remains unresolved. Plans call for a 2050 mile pipeline connecting Iran and other Caspian states to Austria and the EU through Turkey. Construction is slated to start in 2010, and the entire project will cost an estimated $12.2 billion with a capacity to transport 3 Bcf/d. A controversial pipeline proposal is the $7.4-billion Iran-Pakistan-India (IPI) line which would transport Iranian natural gas south to the Asian subcontinent. With a proposed 1724 miles and a 5.4 Bcf/d capacity, the pipeline has been stalled in the past due in part to disputes over the cost of the shipments. Iran and Pakistan have finalized gas sales and purchase agreements, but without India’s participation in the negotiations. It is probable that Iran would extend its domestic IGAT-7 pipeline into Pakistan, avoiding the creation of a new, parallel pipeline. In 2007, Iran generated approximately 190 billion kilowatthours (Bkwh) and consumed 153 Bkwh. Nearly 175 Bkwh was generated by conventional thermal electric power, and about 18 Bkwh was generated by hydroelectric power, with a marginal amount of renewable (wind) power provided. Iran’s nameplate generation capacity is around 49,000 Megawatts (MW), though some plants operate as low as 10% of nameplate capacity. Many of Iran’s power plants are old and in need of repair. Iran seeks to increase its installed capacity by roughly 10 percent annually, keeping in line with its projected 7-9 percent annual demand growth. 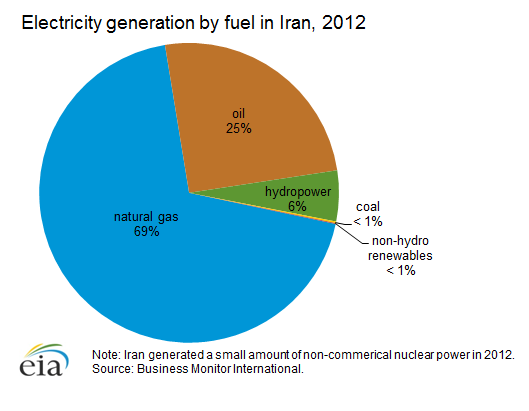 As of January 2010, Iran has no nuclear electric power generation. Iran has focused on meeting higher demand mainly through expanding combined-cycle and hydroelectric power. However, a severe drought during late 2007 and early 2008 adversely affected Iran's hydroelectric production, leaving water reservoirs emptied during the summer peak demand season, resulting in a drop of nearly 70 percent in hydroelectricity power generation. This has brought into question Iran’s ability to fulfill its domestic power obligations, let alone its export obligations. Consequently, as of late 2007 some 85 water dams were under construction. Further investment is required to meet Iran’s future consumption needs. The Ministry of Energy estimates that to meet the growth in demand projected, capacity must reach 60,000 MW by 2015. A substantial element of this new capacity is due to be generated by independent power producers (IPPs), who are expected to have foreign equity stakes. Iran has a number of such projects in preparation, including plans to develop an IPP-based 1,000 MW open-cycle gas-fired power plant in Shiraz with the help of Quest Energy of Dubai. To date, most projects have been awarded through Iran’s state-owned Tavanir but there is recognition that IPPs and private capital are necessary to meet even medium-term demand projections. There is significant controversy surrounding Iran’s nuclear program. Iran claims it is developing its nuclear program solely to generate electricity. However, the United Nations and various other interested parties are attempting to monitor Iran’s use of nuclear fuel and technology. Its first nuclear power plant of 1,000 MW is to be built at Bushehr with Russian assistance and operations are planned to begin in 2010.Russia is also providing fuel under an agreement signed in early 2005.Iran plans to develop 7,000 MW of nuclear-generated electricity by 2020. Iran currently exports electricity to neighboring states including Armenia, Pakistan, Turkey, Iraq, and Afghanistan. Azerbaijan and Armeniasupply electricity to Iran. The Azerbaijani Energy and Industry Minister has stated that talks were held on establishing a circular power grid between Russia, Azerbaijan, Iran, Turkey, and Georgia. Tavanir and Saudi Arabia's Zenel Company have agreed to build a 1,200 MW power plant in Azerbaijan.Iran also plans to develop Belarus’heating stations and to construct a new hydroelectric station in the country.